You heard Joe Schmidt got an 8x multiple? Wow! I don’t blame you for holding out for 8. Your company is so much better than Joe’s. In fact, here are the normalized income statement and balance sheet for both your company and Joe’s. Of course, “normalized” means the assets and liabilities of the balance sheet are listed at their actual current fair market values rather than book, and the income statement is adjusted for things such as owner compensation that deviate from “fair market.” So, we are comparing apples to apples. So you have an offer on the table for 5x EBITDA, right? $500k? Hmm. That’s $325k over the adjusted equity of your business. 2.5x the price Joe has been bragging about. Are you jealous? Of course you’re not. Joe received a higher multiple, but you are not jealous. Balance sheets show invested capital. You and Joe have the same amount invested, and you received 2.5x the price he received. You earned it. Your business is more profitable. And clearly more valuable. Why would a buyer pay 8x for Joe’s business? Well, for one, the value of tangible assets – and maybe more pertinent, the adjusted equity – provides a solid base for value. Joe received a price that is not much over the net value of his assets, so much of the price could have been borrowed, and the risk should be minimal because assets could be liquidated to recoup most of the purchase price. Second, they are planning on improving the profitability. Is this phenomenon unusual? No. It’s an everyday characteristic of the market, and it gives owners of good companies angst. They inevitably hear of certain sellers getting high multiples and automatically think – as most people do – that “better” companies get higher multiples. It’s a misconception, to some extent. It’s true that, all things being equal, companies with certain characteristics will command higher multiples – characteristics such as higher gross margins; more diversification in product, customer type, geography, and talent; barriers to entry, and growth. But companies with high profit margins already command higher prices by virtue of their more sizeable bottom lines. And when a company has a high profit margin, the value of the earnings stream almost always outstrips the value of the tangible assets. The portion of enterprise value that exceeds the value of the tangible assets is called “blue sky” or “goodwill.” This type of value paid is more risky to the buyer because it is not supported by tangible assets that can be sold in a worst-case scenario. Intangible value is ethereal. Companies with high profit margins will earn higher amounts of goodwill, but the multiple of earnings will be lower than companies with lower margins. As a general rule, the overall enterprise value, and the goodwill portion of value paid, will be lower for the less profitable firms, but the multiple of earnings will be higher. Here’s a visual representation using actual data collected and reported by Pratt’s Stats®. Pretty shocking. 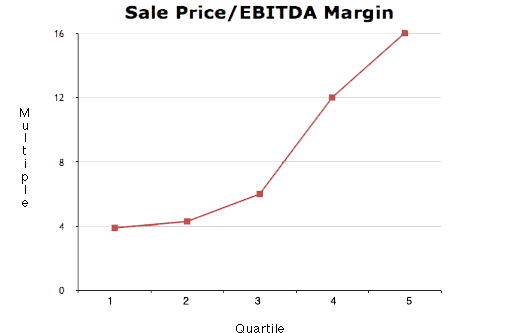 As EBITDA margins decline, the multiple earned (or paid) rises. Significantly. But think about it. Let’s say there is a company with $7 million in annual revenue, $2 million in tangible assets, and $50,000 in annual EBITDA. The purchase price paid is $1.8 million. The sellers did not even get full value for the current fair market value of the tangible assets but received a 36x multiple of EBITDA. Why would a buyer do this? Again, because the buyer expects to improve the profitability, and if he fails, he can get most of this money back by liquidating the assets and closing the business. So, are you jealous of Joe? Should you accept the 5x multiple of EBITDA that is being offered you? If you are near the top of your industry in terms of profit margins, maybe so. Note: Keep in mind that a significant number of the businesses in the Pratt’s Stats transaction database are very small. Many have total revenue under $500,000. For this reason, multiples of EBITDA may be skewed lower than they would be for larger firms.